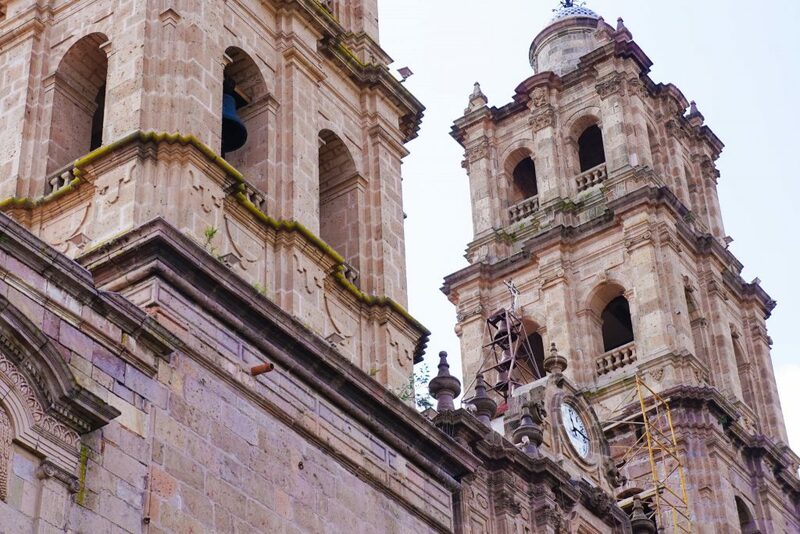 Morelia is one of the most surprising destinations in Mexico. 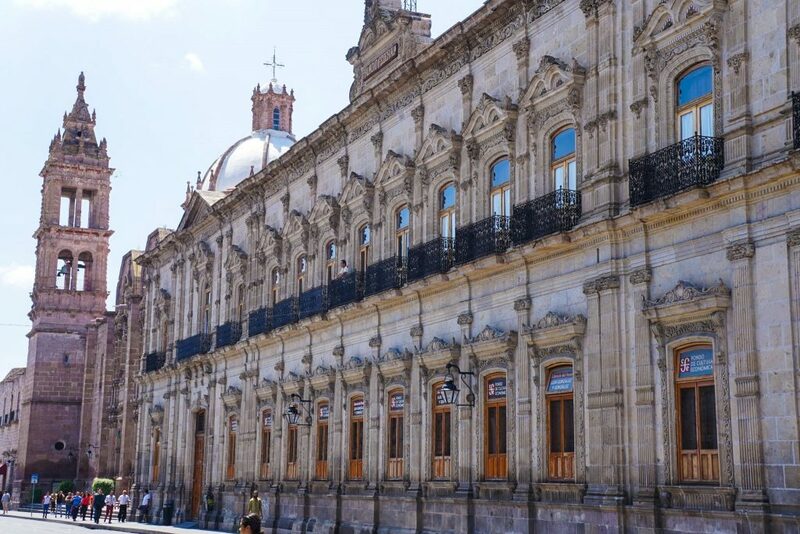 The state capital of Michoacan, Morelia is a dynamic, bustling and stunningly gorgeous city oozing with colonial architecture so well preserved it is literally like being transported back in time. 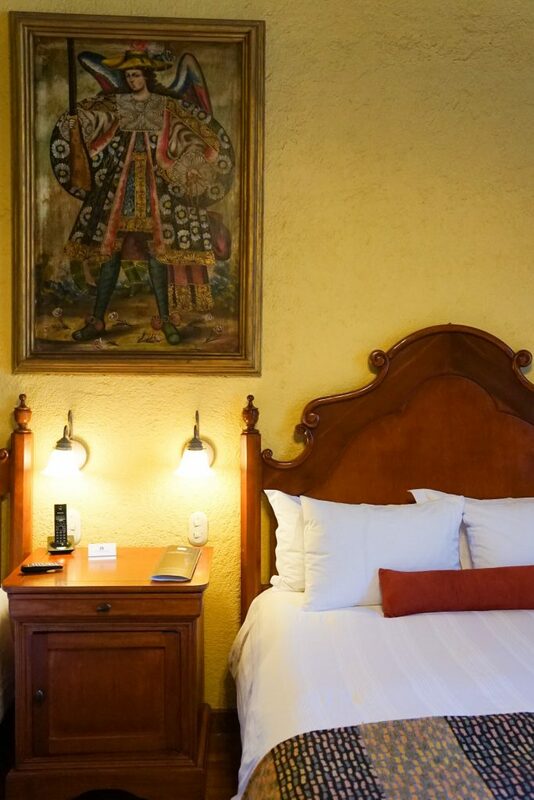 And one of the best places to experience this old-world charm is from within the regal Hotel Los Juaninos Morelia, centrally located with Panoramic views of the emblematic Morelia Cathedral. 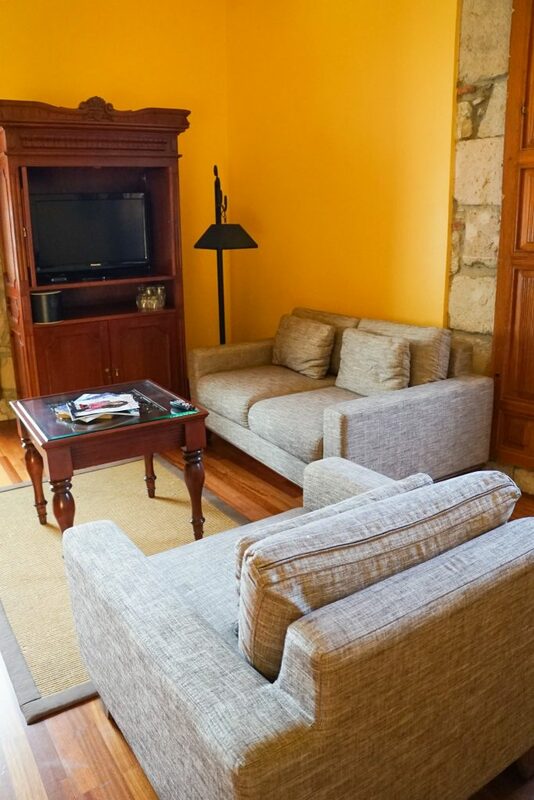 A stay at Hotel Los Juaninos is to immerse yourself in the history of this UNESCO World Heritage listed city, being housed in a 17th-century grand palace tastefully converted into a world-class hotel with 30 boutique rooms – each with a different character and charm, yet with all the modern comfort that a 5 star hotel should have. When you check in you are immediately transported & transformed into the aristocrats of pre-revolutionary Mexico as you bath in the architectural granduer found through-out Los Juaninos: from the ornate facade and old stone walls to the high-ceilings, glorious arched hall-ways and balconies with view’s to die for. 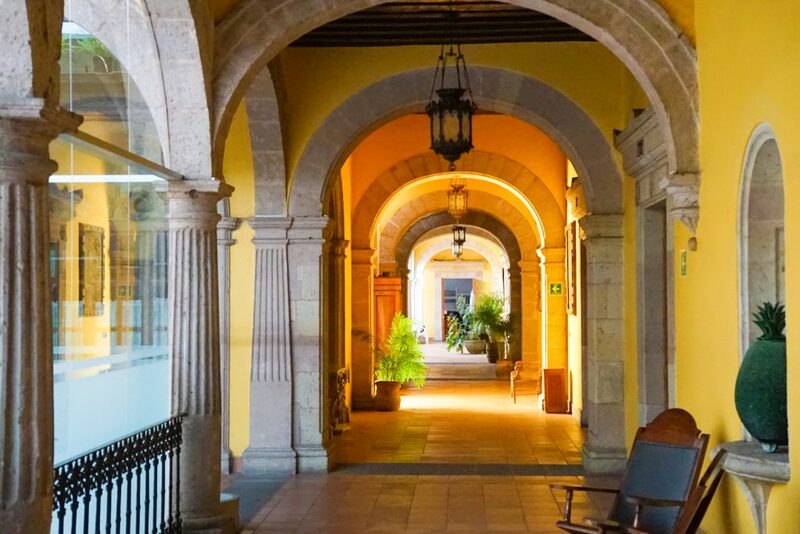 No other hotel in Morelia offer’s such a harmonious experience, seamlessly continuing the surreal Spanish colonial spirit of the town into it’s lobby, guest-rooms and suites. 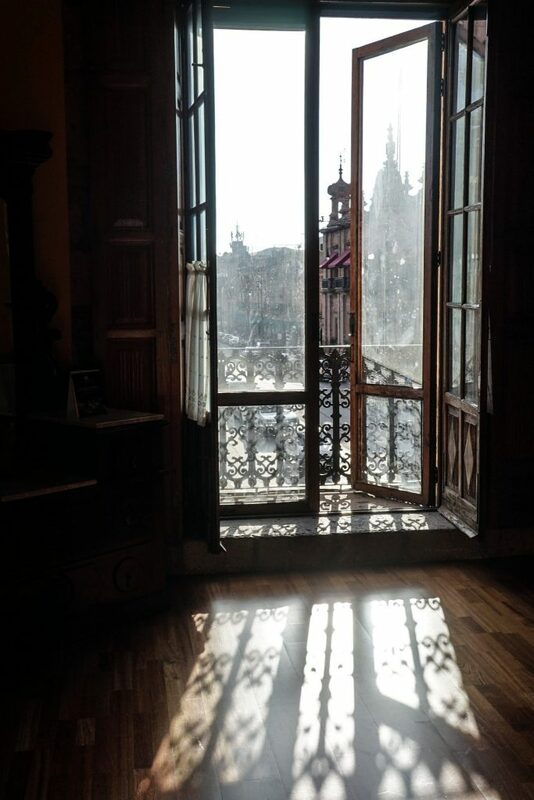 If you have travelled to Morelia to admire its glorious past, Hotel Los Juaninos Morelia offers the perfect compliment as a window back in time. 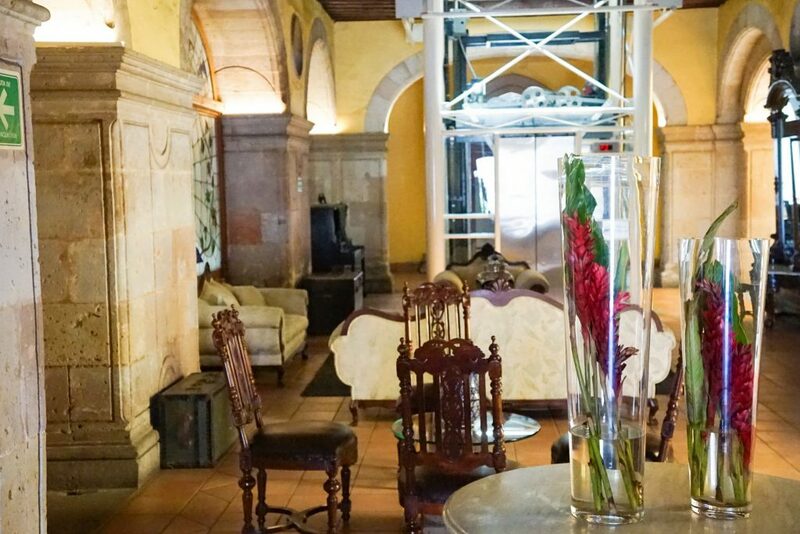 Hotel Los Juaninos in Morelia, Mexico: Old-World Charm and Views To Die For! 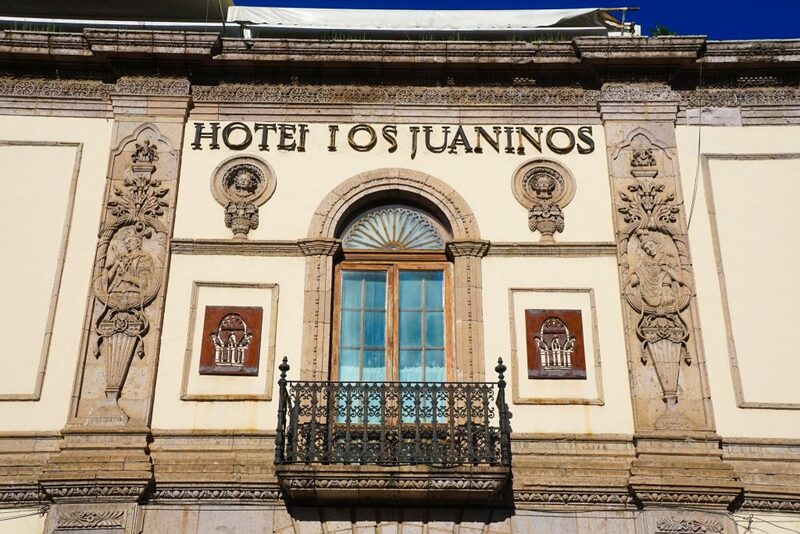 The building in which Los Juaninos currently inhabits has a long and proud history – as is to be expected for it’s privileged position right on Morelia’s main square. It was ordered to be constructed – then as a opulent Bishop’s Palace – by the Captain General of New Spain in the late 17th century. 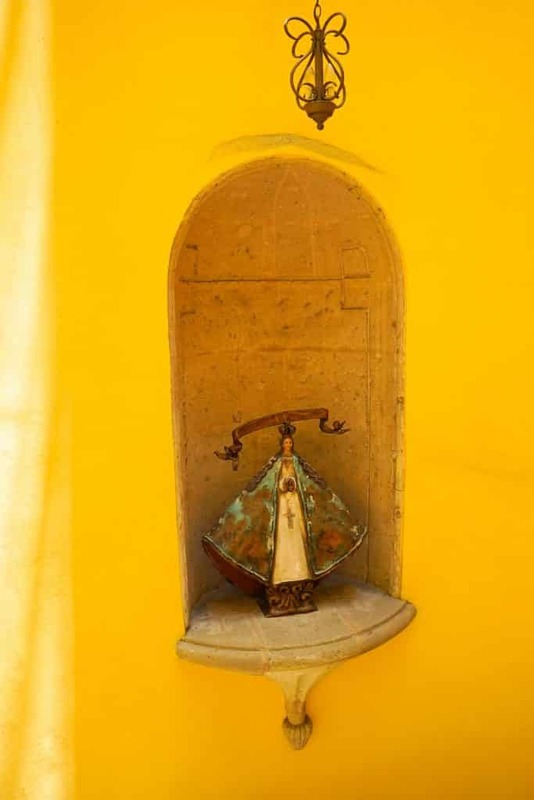 In 1700 was then turned over to the Los Juaninos religious order who converted it into the Royal Hospital of San Juan de Dios. 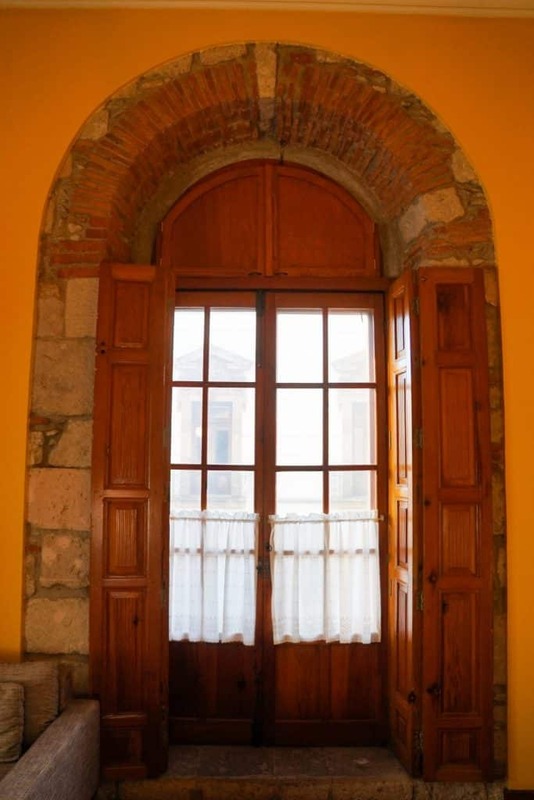 For over a century it maintained this purpose and even today is still marked as such on many maps of interesting historical buildings in Morelia. 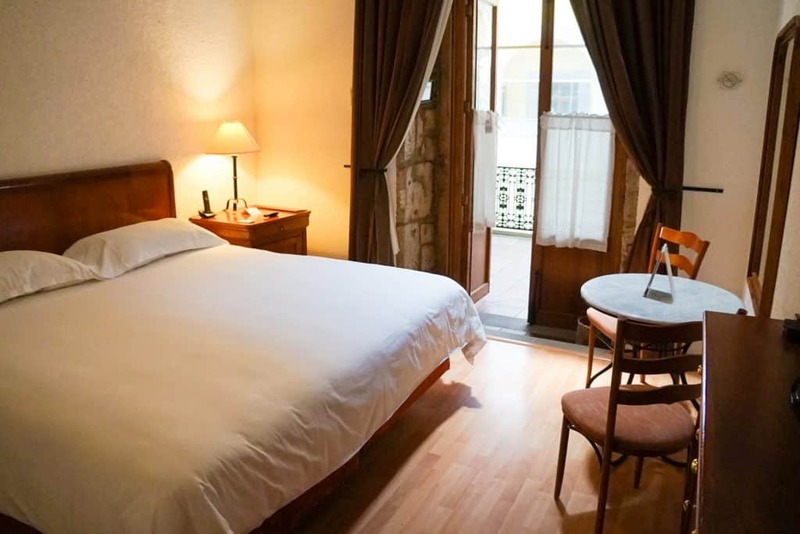 In 1857 however the building would find a new use as it was sold into private hands and transformed into the Hotel Oseuera, even then one of the most luxurious hotels of it’s time. 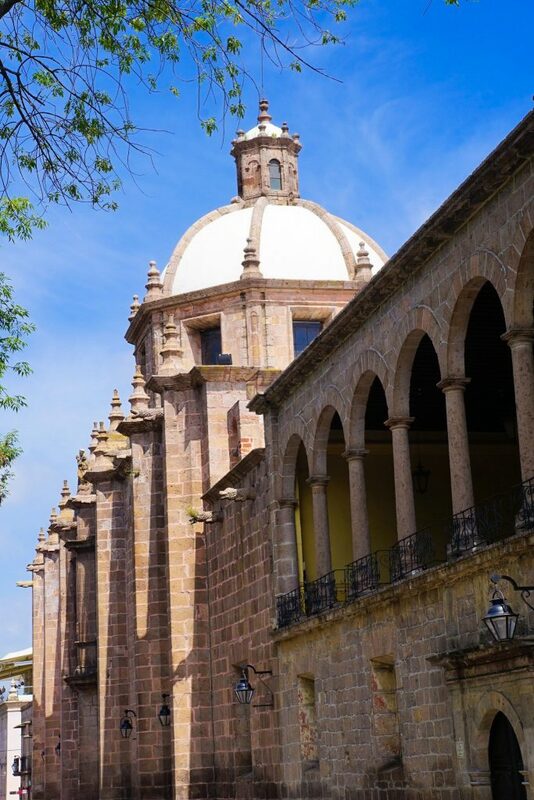 Heavily influenced by the romantic architectural style trend of the time, it largely catered to the elites and nobles who travelled on the newly opened Mexico City to Morelia railway line. 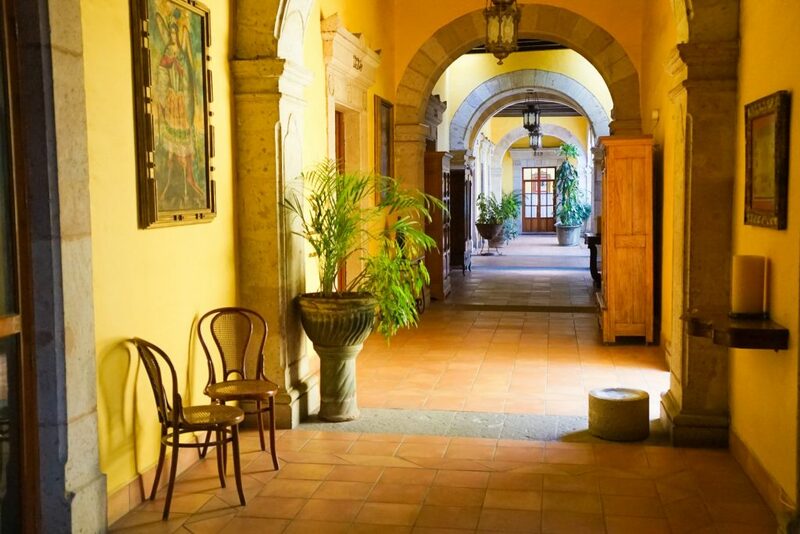 Over the next hundred-odd years the buildings fortunes waxed and waned, as did those of Morelia and Mexico in general, but finally in 1998 the entire building was restored with no expense spared to it’s original splendor as the Hotel Los Juaninos. 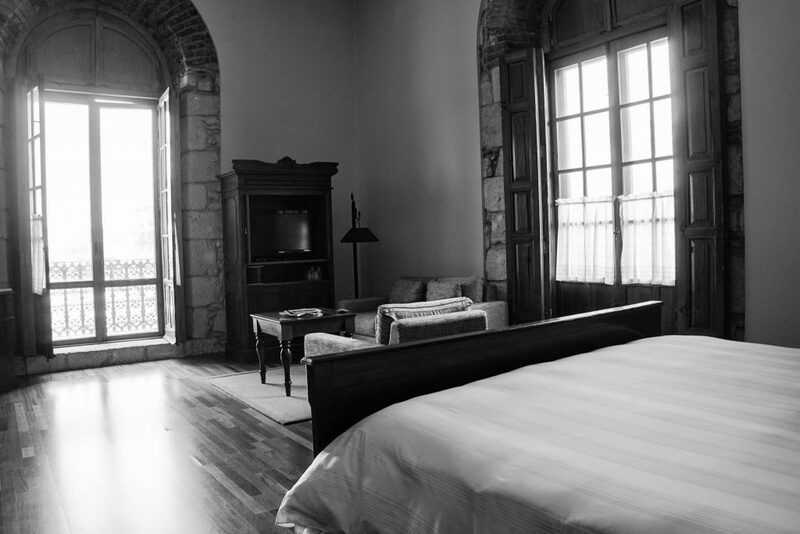 Once again the Bishop’s Palace opened it’s doors as one of the most luxurious and coveted hotels in Morelia with a location that simply cannot be beat! 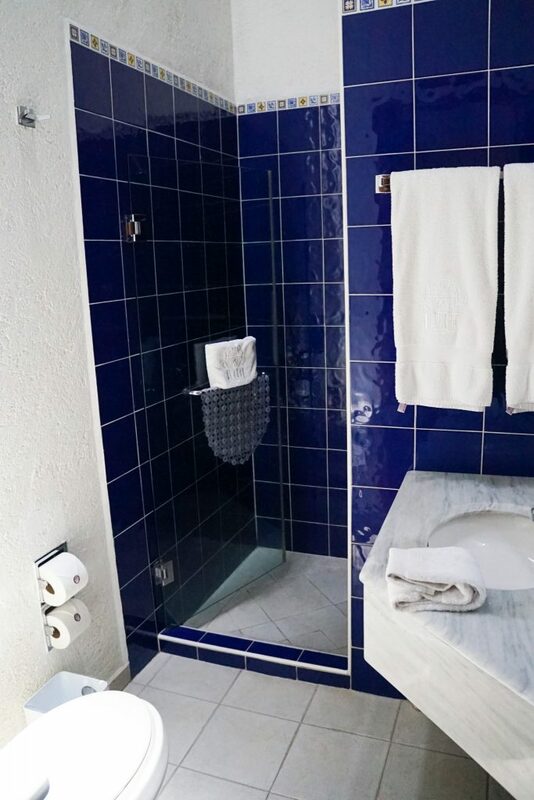 My favourite part about this unique hotel in Mexico is that each of it’s rooms are completely different, meaning you could return time-and-time again and have 30 distinct experiences to enjoy! 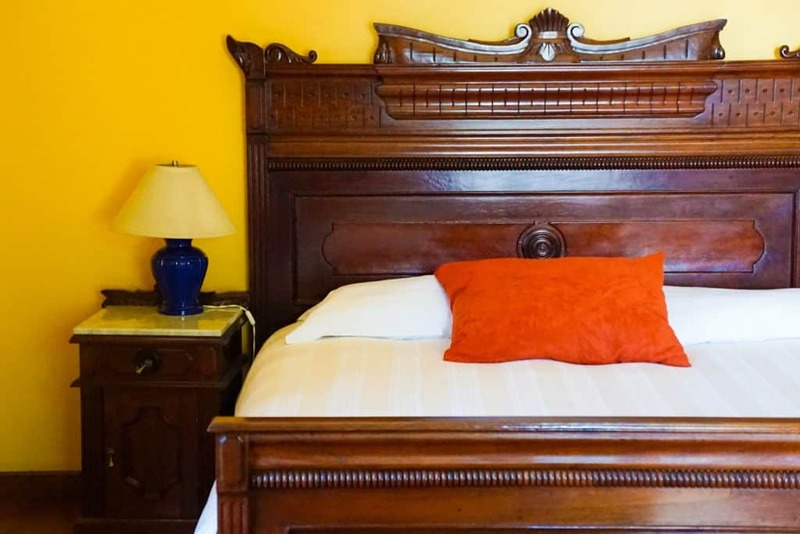 Each room has it’s own individual design and feel, and each preserve historical elements of the 19th century hotel including original wooden doors, arched ceilings, European bathtubs and more. 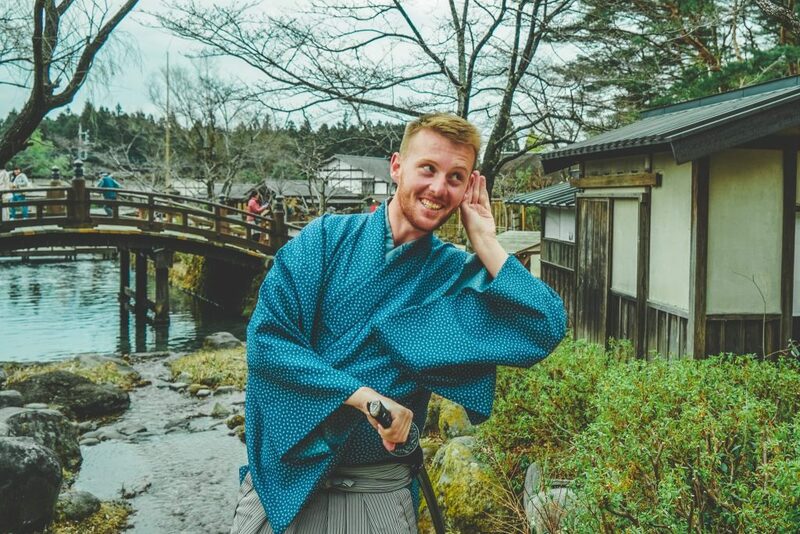 Complete with beautiful and historically representative pieces of art it is truly possible to feel immersed in the past. 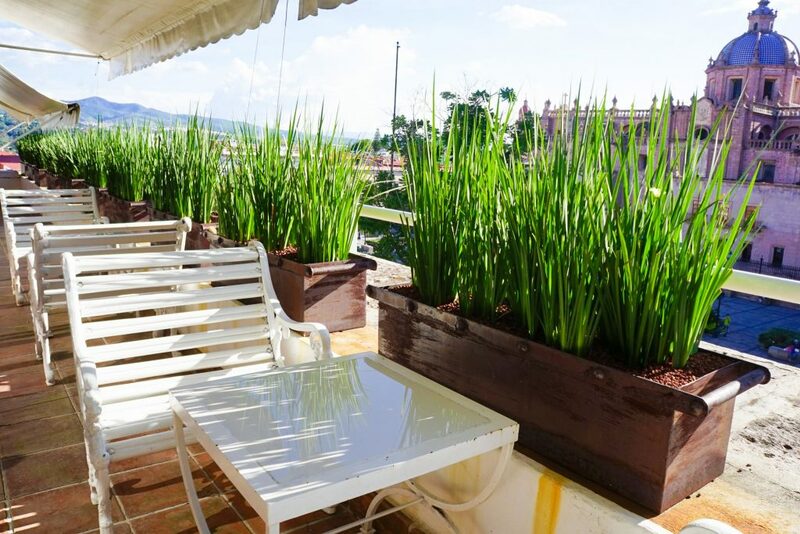 There are however, three basic guest-room types on offer: suites, balcony rooms, and internal rooms. All are simply stunning, but for the full experience I do think it’s extremely worth it to spring for the balcony rooms at a minimum. 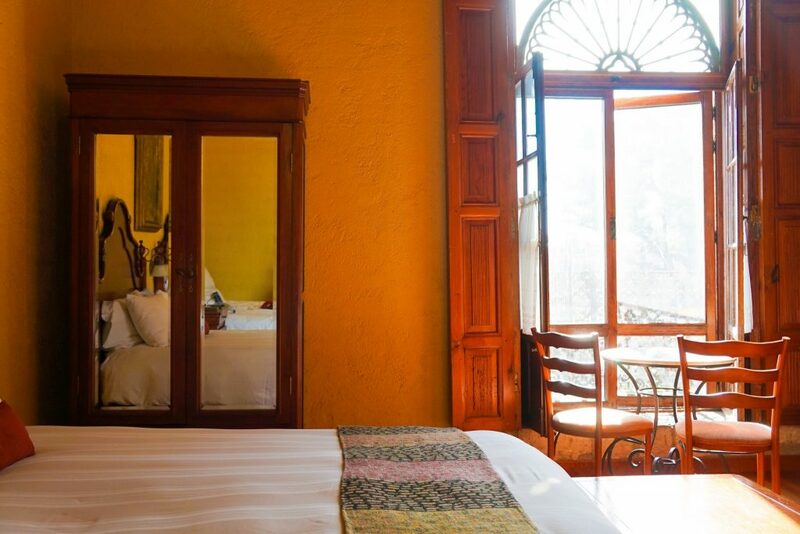 These rooms offer simply breath-taking views of Morelia’s cathedral that change through the day from the soft tones of the pink quarry stone during the day to it’s magical glow at dusk and it’s perfect illumination at night. 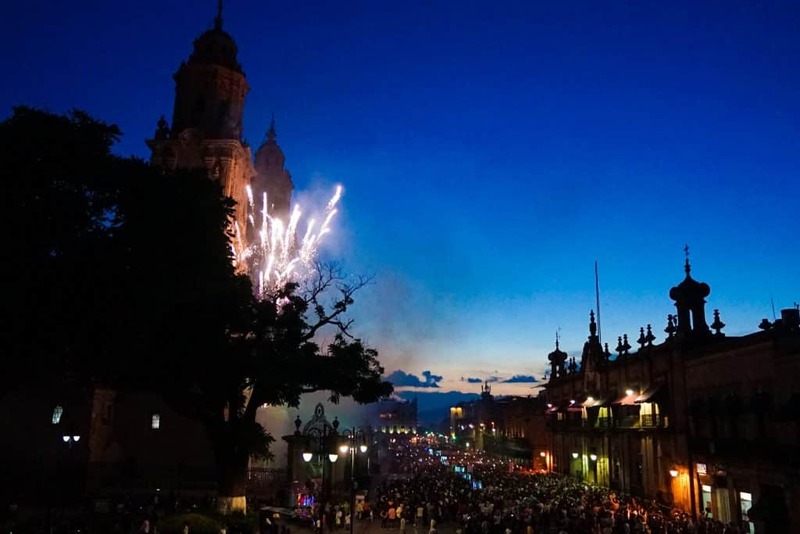 Better yet – if your stay includes a Saturday there is a fireworks display in Morelia in front of the Cathedral at 8.45 for which you will have prime view. 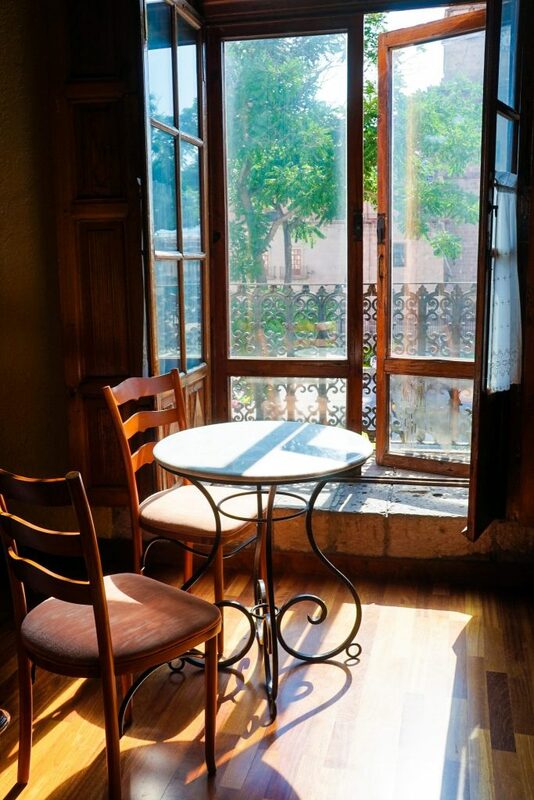 If not – the balcony still offers immersive views and the cities main square just across the street provides hours of entertainment in the form of people watching. Much like the rooms, the view is never dull. And almost anything else you may need help with in Morelia. Reservations, questions and more! 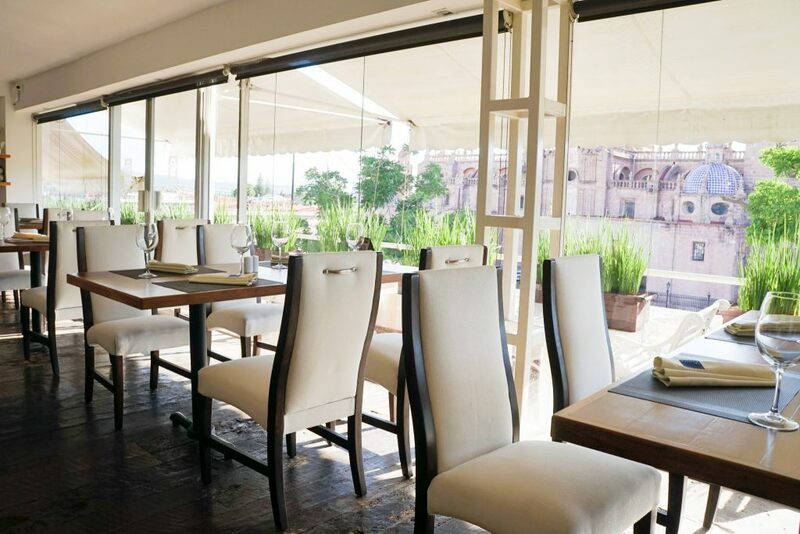 When considering where to eat in Morelia Mexico you need look no further than La Azotea – the onsite restaurant and bar taking up the top-floor / rooftop of Hotel Los Juaninos with the best views of the Morelia Cathedral by day or night. 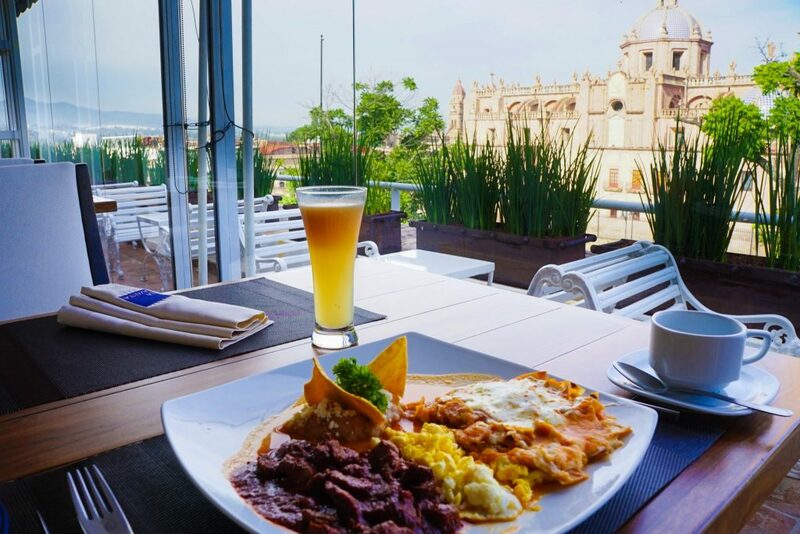 Open for breakfast, lunch and dinner everyday La Azotea Morelia Restaurant offers a relaxed, fine-dining feel with a very chic white fit out and views from every table. Perfect for an early morning breakfast, sunset drinks or a romantic dinner. On Friday nights there is live music from 10 pm and Saturday’s there is a DJ playing alternative pop and retro music into the night. 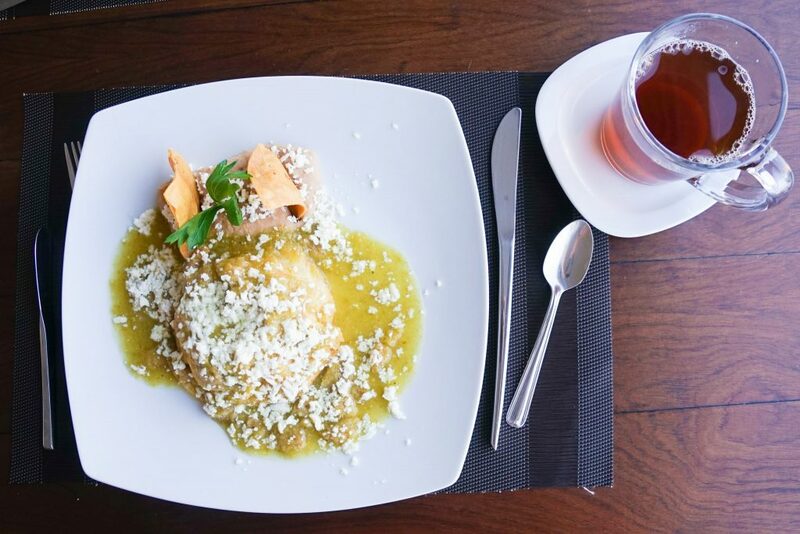 The food is focused on contemporary Mexican gastronomy which is heavily influenced by Morelia’s own regional tastes – and thankfully, this is one restaurant that doesn’t coast on it’s fabulous views and the food is just as incredible. 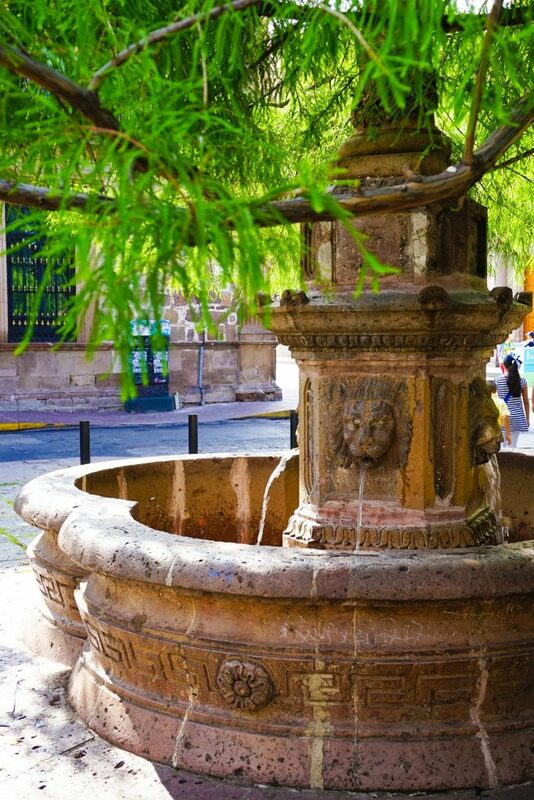 Things To Do in Morelia And Around! The Morelia Cathedral: Enormous, Grand, Baroque. You can’t fail to miss this but be sure to pop in to truly appreciate it, and look out for the many street performers that appear on the square outside during the day. 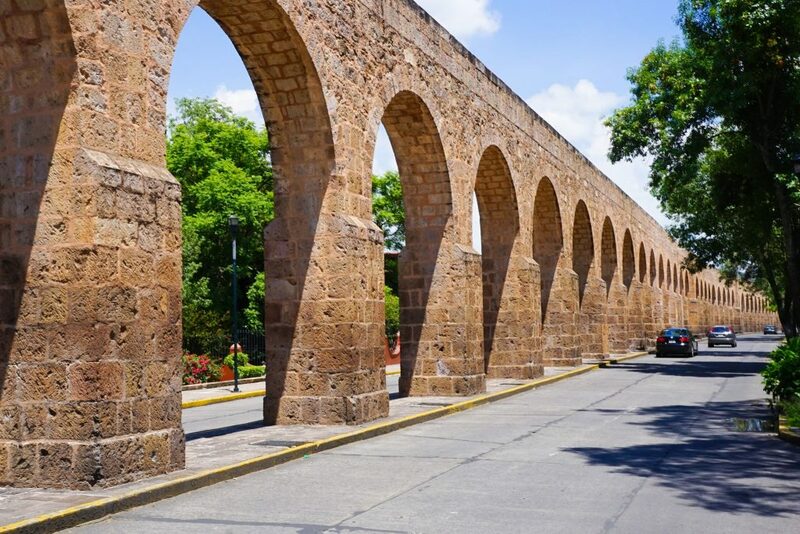 The Morelia Aqueduct: Hidden at the back of town, this huge aqueduct runs for over a kilometer and brought water for this young growing city in the 17th century. 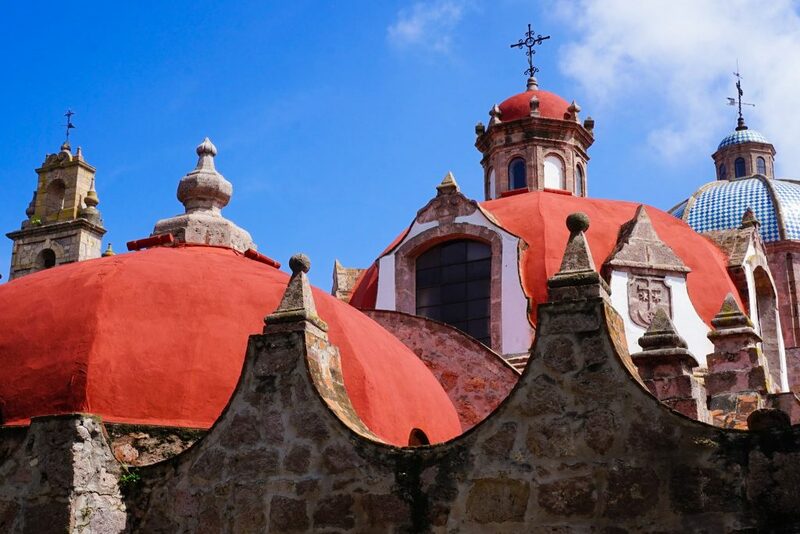 The Guadelupe Sanctuary: One of the most beautiful churches in Mexico, its soft pink and white details are a splendid work of art and will leave you in awe! 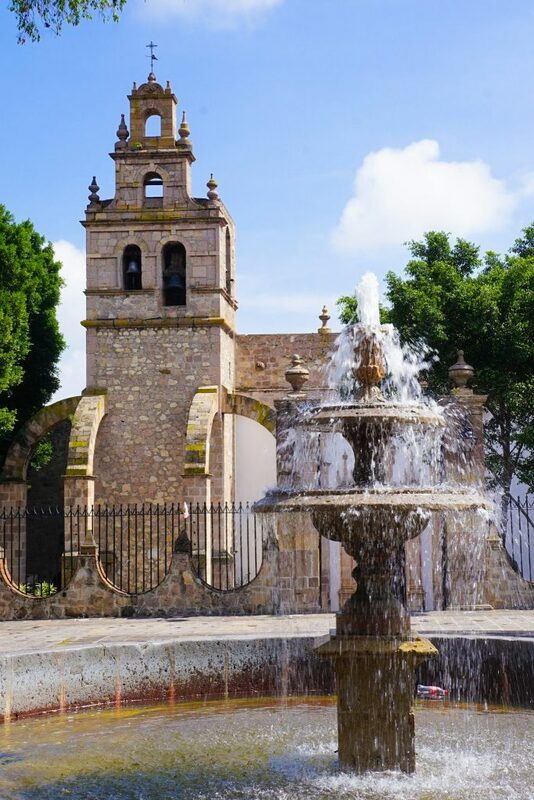 The Houses of Morelos: Morelos is a Mexican Independence War Hero who the city was renamed after. 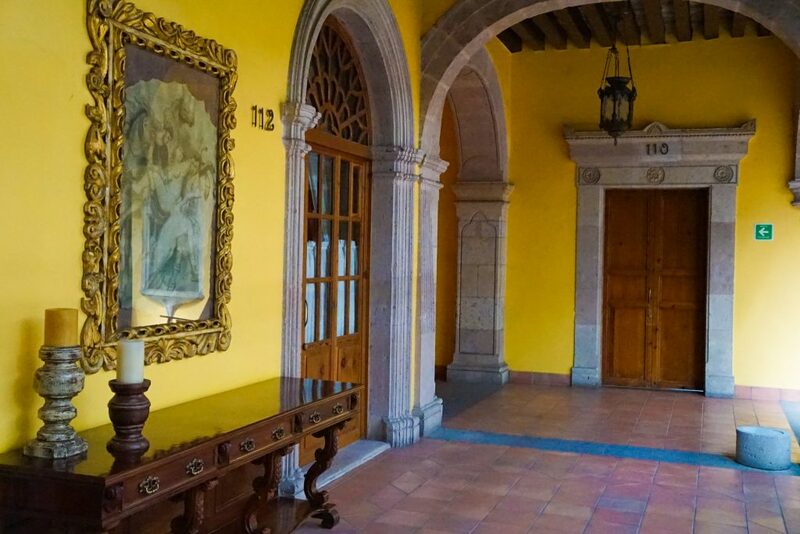 Both of his houses have since been converted to museums are interesting to understand his role in shaping Mexico. 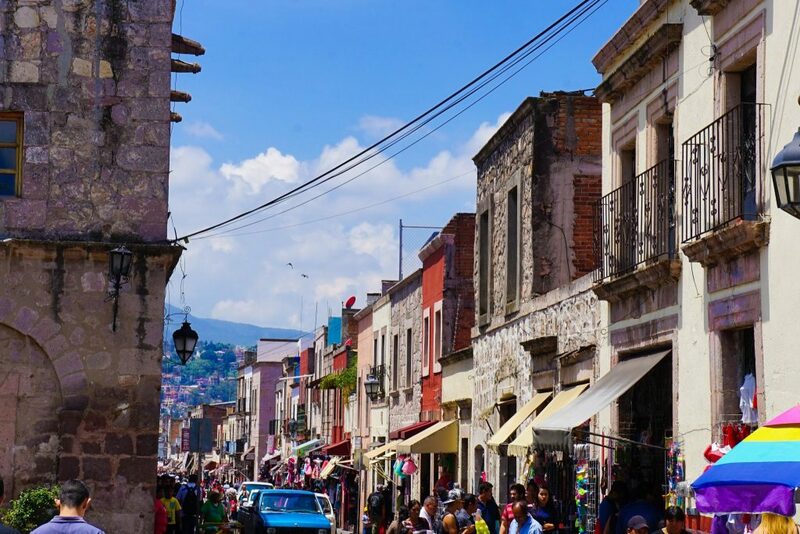 15 Cultural, Culinary And Creative Oaxaca City Things To Do! 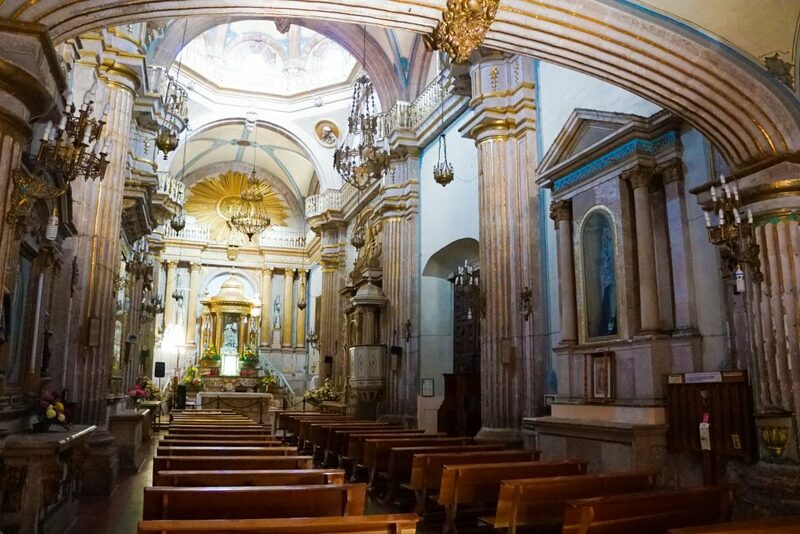 11 Reasons Why You Have To Go To Campeche: Mexico’s Rainbow City! How To See Chichen Itza Alone Without The Tour Groups or Crowds! 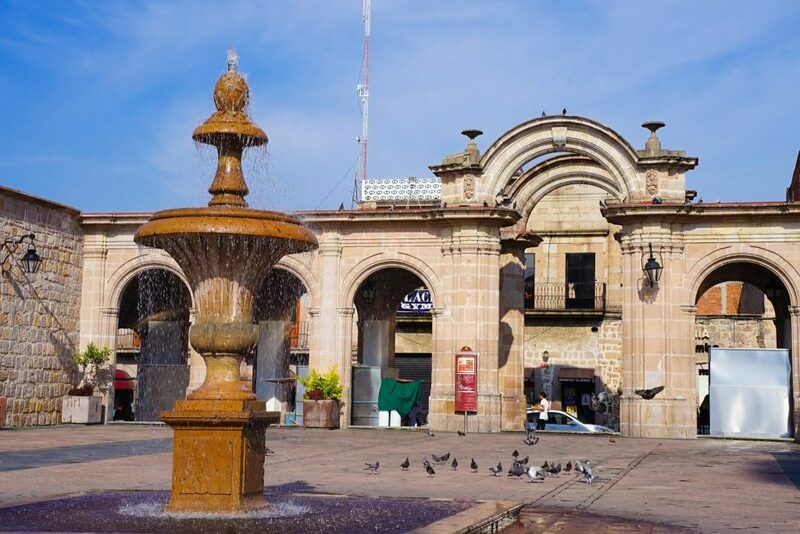 Ok – so by now you must be sold on the beautiful yet unassuming Morelia City and are probably wondering how far is Morelia from Mexico City as you try to fit it into your itinerary! 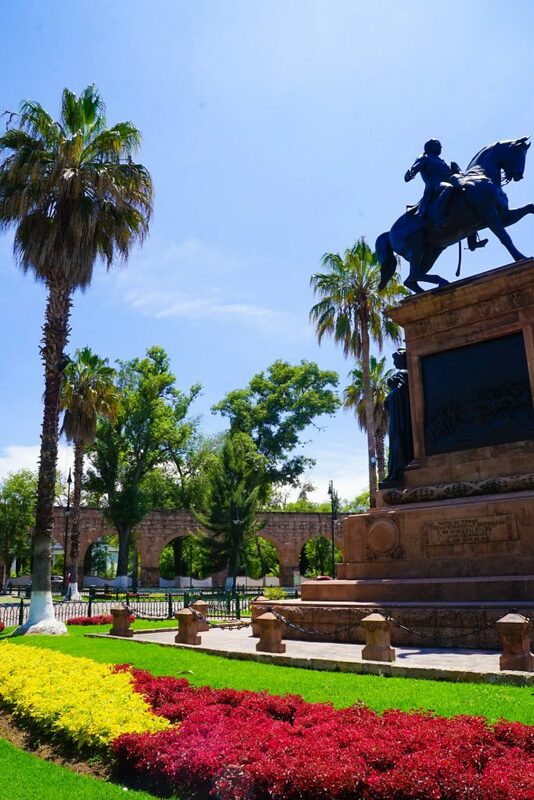 No worries – It is very easy to get to Morelia by bus, car or plane – and actually it is located almost half-way between Mexico City (303 km) and Guadalajara (250km), the two biggest cities in Mexico, making it a great stopping point! 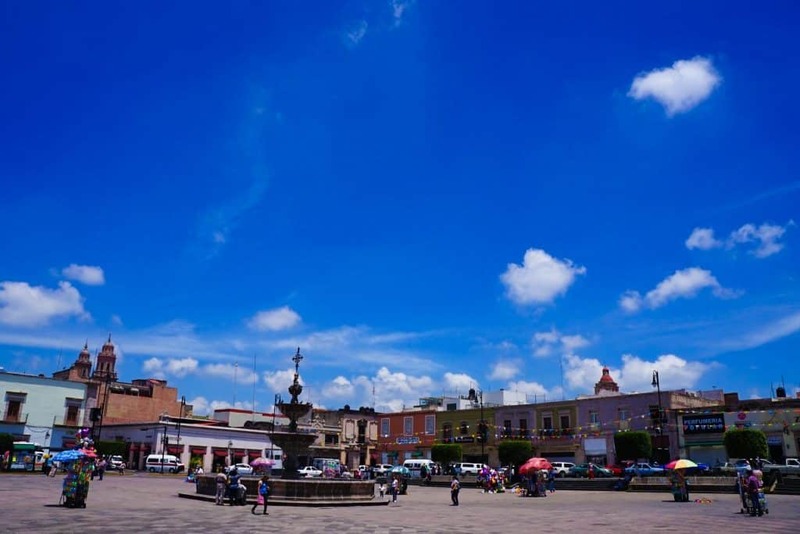 By bus you can arrive to Morelia at it’s new bus station in the cities north (60 pesos taxi to downtown) with direct connections to Guadalajara (3.5 hours), Mexico City (5 hours) and beyond. There is even a new Greyhound service to Morelia direct from the United States. By car the journey is fast on a modern toll road with plenty of rest stops along the way and incredible desert scenery and lakes that reflect the sky. 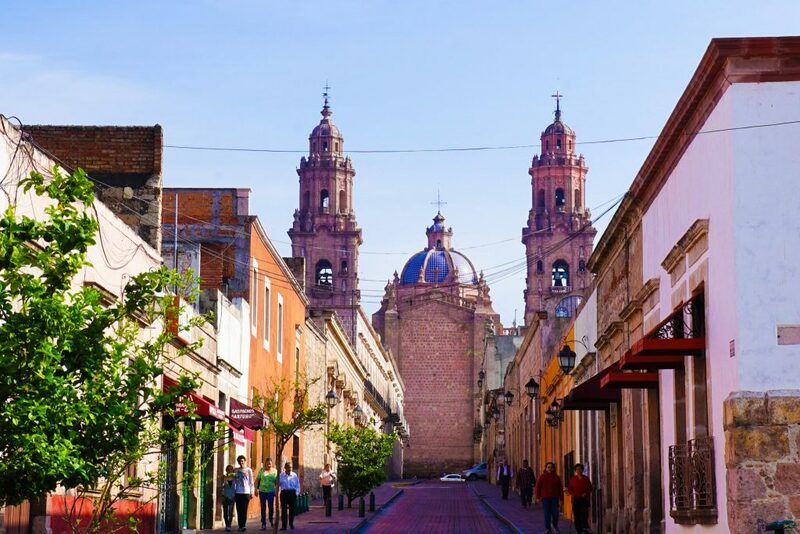 Of course – for many the plane maybe easier which is great as Morelia International Airport offers daily international flights to Los Angeles, Dallas-Fort Worth, Houston, and Chicago as well as many domestic flights including to Guadalajara, Mexico City, Monterrey, and Tijuana. 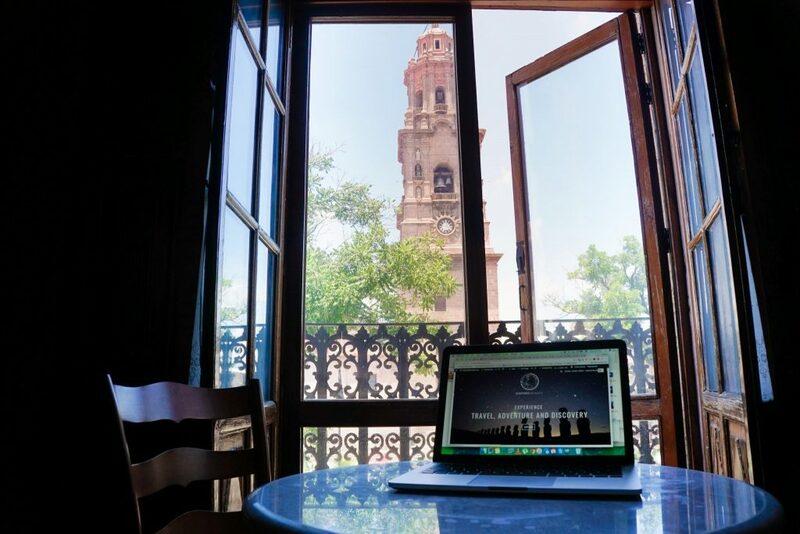 And don’t forget the guys at Hotel Juaninos (as if you could even forget the best view in Morelia!). 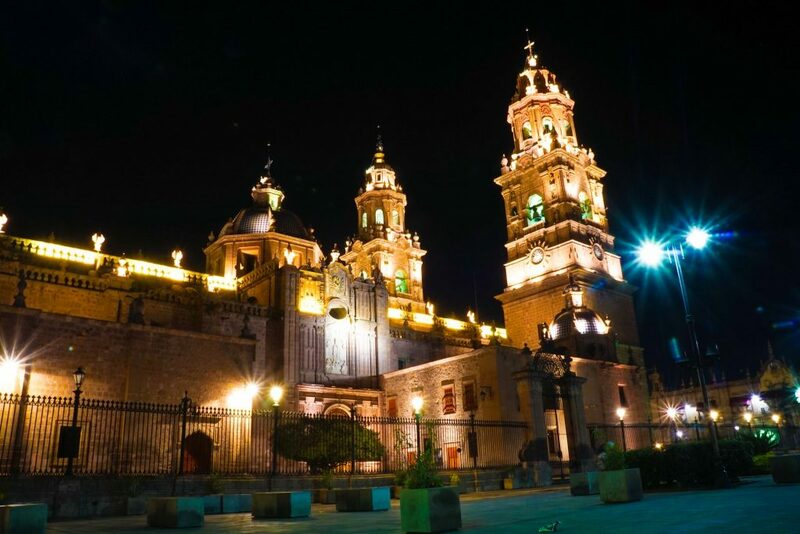 For such a well connected city it truly is surprising that Morelia has not yet caught the eye of mass tourism! 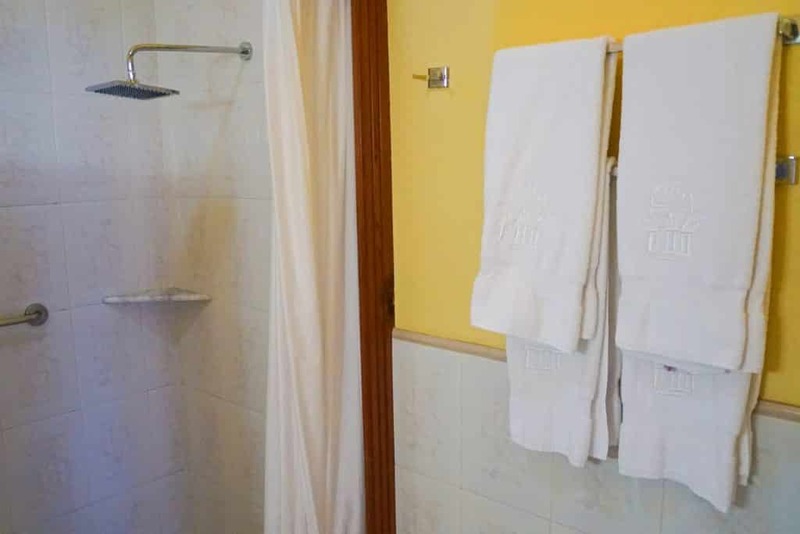 Which is probably for the best as those who arrive here are rewarded with an almost entirely intact colonial city in all it’s splendid details. To truly make the most of your stay consider Hotel Los Juaninos, the most luxurious hotel in Morelia with the best view – it is truly like being transported back in time, except with all the modern amenities you could desire along with great service, food and rooms – and with having one of the best Morelia restaurants on your rooftop you will never be wondering where to eat in Morelia Mexico! I will never forget my nights gazing off their balcony onto the Cathedral as the sunset and the lights transformed it, and I hope you can enjoy this too!